This new “artistic and intellectual triumph” is by Patricia Amlin, the extraordinary animator who created our widely honored and best-selling film, “Popol Vuh: The Creation Myth of the Maya.” Just as “Popol Vuh” took authentic images from ancient Maya ceramics and turned them into a riveting retelling of the Maya creation myth, so “The Five Suns” employs authentic pre-Columbian Aztec iconography to depict the most important creation myths and sacred stories of the Aztecs and other Nahuatl-speaking peoples of ancient central Mexico. 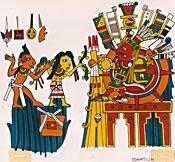 All imagery derives from the colorful and brilliant art style of late post-Classic Mexico (A.D. 1250-1521), as taken from the body of pre-Conquest codices known collectively as the Borgia Group. These ancient screenfold books are filled with detailed and vivid scenes of native calendrics, rituals, mythical events, and cosmology. “The Five Suns” tells how Quetzalcoatl and Tezcatlipoca create heaven and earth, journey to the underworld to create humans and find sustenance for them, and finally create the sun and the moon. Like all creation stories, this one provides mythic answers to life’s most perplexing questions and offers an ethical vision of how we should live. “The Five Suns” is essential viewing in a wide variety of classes and at many educational levels. it was funded by a grant from the National Endowment for the Humanities. "An amazingly happy combination of scholarly accuracy and artistic quality. I presently use the Popol Vuh film in two separate courses, but the combination of it with this new film will provide me with a wonderful introduction for students to two important Mesoamerican mythologies and a vivid ´compare and contrast´ showcase for two different Mesoamerican artistic styles. — Peter L. van der Loo, Prof. of Humanities and Religious Studies, Northern Arizona Univ.